RIMAG has helped the site to access funding streams for projects and events that are not open to the site owners (now Warrington Borough Council). To date we have raised over £70,000. This work continues. If you would like to help our fund raising, or find out more information, please get in touch using our Contact Page. RIMAG supports the Ranger Service in the carrying out of public events at Risley Moss. The support can vary between providing back-up on guided walks to see the site’s wildlife, ‘willing hands’ to help at children’s activity events, and events to promote wildlife in the wider community such as bird feeder making. These events are publicised through the Warrington Borough Council website and our Events Page. If you would like to help at events or find out more information, please get in touch using our Contact Page. We also support the annual Green Safari open day in June, which attracts over 1000 people to see a large variety of exhibitors. 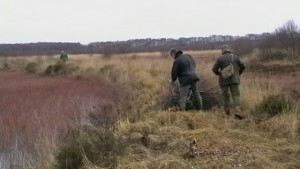 To help accelerate recovery of the mossland habitat, RIMAG also provides physical support to the Rangers Service for large scale site management tasks on the mossland. We have a group of volunteers to carry out, for example, the clearance of encroaching scrub. If you are interested in getting more involved with the activities at Risley Moss, you could join the RIMAG volunteers. Tools and equipment are provided but you will need warm clothing and waterproof footwear. Typically, we meet at 10:00 at the Risley Moss Visitor Centre one Sunday per month. If you would like to join or find out more information, please get in touch using our Contact Page. RIMAG supports the Rangers by surveying wildlife on the site. We have an on-going programme of surveying nesting birds, dragonflies and butterflies. This helps the Rangers monitor the impact of site management operations on the numbers and on-site distribution of its wildlife. We take the opportunity to involve newcomers to wildlife identification and surveying as part of this work, so previous experience is not essential. If you would like to become involved in surveying or find out more information, please get in touch using our Contact Page.